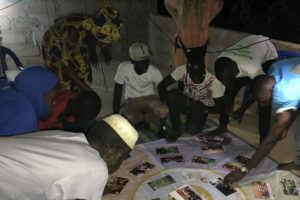 A lot has taken place in and around the eco-community of Guede lately, including at least three partnership programmes made possible with the financial and technical support of ​Damanhur and coordinated with REDES (French acronym for Network for Ecovillage Emergence and Development in the Sahel). 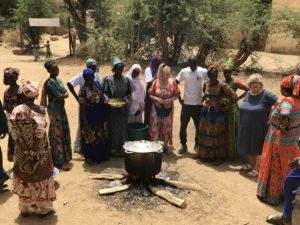 Some of the work includes planting an orchard with a women’s association in Madina Fresbe village (a community of herders), training over a hundred women from 15 villages in food processing, and rescuing the community center in Guede. The first edition of our green programme was organized in March/April. Over 1,400 fruit trees were planted in 10 sites in six villages. The survival rate of the trees is a miracle (almost 98%). This happened as each tree was sponsored by a family. The risk for the trees came from excessive care as they received water non stop. REDES is currently working to transform 35 traditional villages into a federation of ecovillages. Community surveys are taking place now in 12 villages and alternative cooking lessons are being offered to the communities. One of the major issues in Senegal now is that people tend to eat too much rice and oil and also use chemical seasoning from the food industries. Diabetes, blood pressure problems are silently wreaking havoc among the population. Re-educating people in their eating habits is vital to create healthier and happier communities. REDES has enclosed 5 hectares and is working to turn it into an open community biodynamic farming school. A multifunctional training center will be built next door. These two pieces of infrastucture will be the heart of the transnational ecovillage hub. Community orchards were developed in Lahel, Fresbe, Guede, Diara, Moundouwaye with the support of CIFAL/Scotland and UKaid. The success of the programme encouraged us to upscale it and create a transnational hub. REDES has also been able to build 12 classrooms in 5 villages in the northern region of Senegal and distributing free school materials with the support of a Nice-based Association ‘Soutenir l’Enseignement en Afrique’. We are proud to say that with this partnership we are able to send 600 students to school.